You'll find the Oasis Hotel between Harlow and Bishop Stortford. Convenient access to the M11 and M25 and those flying to and from London Stansted. It may be a little old fashioned and traditional but it gets the job done, which will suit business types and users of the nearby airports down to the ground. As a bonus the hotel offers free airport parking for seven days. The rooms are kept clean and are equipped to a reasonably high standard even if they lack a little in the way of imagination. There are two restaurants on site: The Old Cathway and The Essence of India. The Cathay serves a terrific range of Peking, Szeuchan, Cantonese and Malaysian dishes whilst the Essence of India does nice line in authentic Indian Cuisine. The location is difficult to beat for those with flights to catch. Standsted Airport is little more than 20 minutes drive (ten miles or so north of the Oasis) and the The number 510 bus runs every 20 minutes on a 24/7 basis between the hotel and the airport. Guests at the Oasis hotel will find plenty of places to visit including the Lakeside and Bluewater shopping centres and the splendid Lee Valley, a 10,000 acre park featuring tennis courts, heritage sites, nature trails and gardens and no end of sporting facilities. 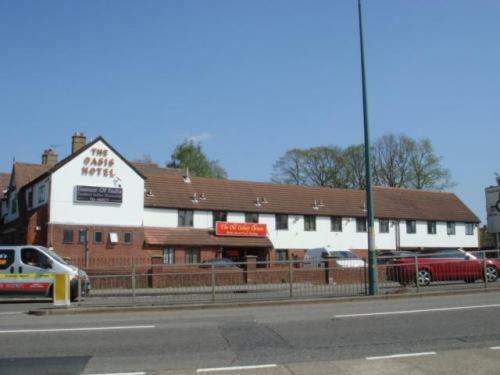 The hotel is 350 metres from Harlow Mill Railway Station.